Surveyors from the Michigan Department of Licensing and Regulatory Affairs were at DMC Detroit Receiving Hospital this week "to evaluate compliance with health and safety requirements." State quality inspectors went to DMC Detroit Receiving Hospital on Wednesday to conduct a full survey of the hospital, one month after it was cited for failure to comply with Medicare conditions of participation in a limited survey on infection-control practices, Crain's has learned. At least 38 deficiencies were found in four infection-control and patient rights standard categories at Receiving Hospital, according to the Michigan Department of Licensing and Regulatory Affairs, which conducts surveys for the U.S. Centers for Medicare and Medicaid Services. Deficiencies at Receiving included possibly unauthorized restriction of nonviolent patients, patients with surgical-site infections not properly evaluated by quality assurance, surgical patients who could have been exposed to infectious agents from dirty instruments not properly evaluated for possible infections, and surgical staff not following proper hand hygiene and glove use rules. In one incident, LARA inspectors said a surgical staff member told of an incident in September where an ink pen was found inside a surgical instrument tray in the operating room. No documentation was immediately found on the event and the central processing department director was unaware of it. After a short investigation it was discovered that the ink pen was discovered Sept. 27 before surgery on a 50-year-old male. The dirty tray was removed and a new tray brought in to complete the surgery. No other information was available on the incident. Crain's reported infection control and instrument cleaning allegations by physicians and other staff in an Oct. 7 article on problems with DMC's cardiology program. From Oct. 15-18, LARA inspected Receiving Hospital and Harper University Hospital. It also inspected Children's Hospital of Michigan based on separate complaints. CMS told Crain's that it did not find any quality problems at Children's Hospital for the departments it surveyed. In a statement, DMC confirmed that surveyors from the agency arrived at Receiving on Tuesday to conduct the survey "to evaluate compliance with health and safety requirements." The DMC statement said the hospital, which is owned by Tenet Healthcare Corp, a for-profit chain based in Dallas, welcomed the inspectors. On Nov. 21, DMC submitted to CMS a 27-page letter that outlined how it plans to correct the deficiencies in patient rights and infection control. "We expect this survey to continue over the coming days, and the hospitals' certification to treat federal program patients will continue without interruption throughout the survey process," DMC said in the statement. Earlier this week, Crain's reported that DMC Harper University Hospital was notified it was cited for at least 22 deficiencies in infection-control quality standards, CMS said. Deficiencies at Harper included bugs flying around intensive care unit patient areas, dirty kitchen and food handling areas and a surgical instrument tray opened potentially too early for the operation and improperly covered with blue towels that violated infection control rules. "Although surveyors have not yet arrived at Harper University Hospital, we will work with them when they do arrive," DMC said Wednesday morning. "DMC remains committed to providing residents of Detroit with safe, accessible, quality care. This commitment is central to our mission and everything we stand for." 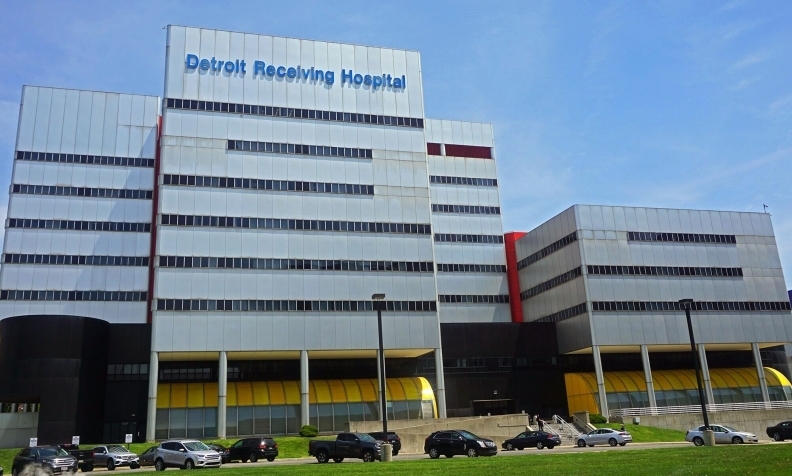 On Nov. 7, DMC Detroit Receiving received a letter from CMS notifying it that it failed to be in compliance with four standards on patient rights, infection control, infection-control program and infection-control leadership that included about 38 separate incidents of deficiencies. "The deficiencies cited are significant and limit your hospital's capacity to render adequate care and to ensure the health and safety of your patients," according to the letter from CMS to Harper officials. "Your hospital is subject to termination from the Medicare program for noncompliance with the Medicare conditions of participation," CMS said. While CMS always provides this language when notifying a hospital it is subject to an unannounced inspection following complaints, CMS inspects hospitals more closely that have been subjects of multiple inspections and complaints. However, the only remedy CMS has to discipline hospitals is termination from the Medicare program, a very rare and unlikely event for hospitals but one that would have far-reaching financial consequences. "Should CMS decide to impose termination (from Medicare), at that time, you will receive official notification of our decision and have the right to request a hearing before an administrative law judge of the United States Department of Health and Human Services' departmental appeals board," the CMS letter said. • Failure to ensure that the physician order for the restriction of freedom of movement for a nonviolent patient was renewed in writing at least every 24 hours. This resulted in unauthorized use of restraints on at least three patients. • Failure to maintain an ongoing infection-control program designed to prevent, control and investigate infections and communicable diseases for the last 12 months reviewed. This could result in the potential for transmission of infectious agents for all patients served by the facility. • Failure to ensure the infection-control plan and surveillance policies followed national guidelines. This resulted in failure to report, investigate and implement correction measures for non-government mandated reported surgical site infections found over the past year. • Failure to follow infection-control policies for donning and removing gloves and hand hygiene in the operating room. Failure was found in three of five observations during the visit. • Failure of the CEO, medical staff and director of nursing services to ensure the hospital quality assessment and performance improvement program addressed infection-control issues in seven out of 15 patients with surgical site infections. • Failure of top responsible executives to ensure breaches in sterile processing of surgical instruments were documented, investigated and corrective measures implemented. • Three of four nonviolent patients with restraints were found to be in "soft restraints" more than 24 hours and longer than authorized. • Six of seven patients with surgical site infections were not evaluated by the performance improvement program, according to hospital policies. • Six contaminated instrument events were documented from Sept. 15 through Oct. 5. Only two of five patients who were involved in the dirty instrument problems were reviewed for problems. • Neurological surgeries were assessed as high risk for surgical site infections, which should have triggered a management intervention. However, no risk analysis was done. Staff reported that layoffs prevented full reviews. • Two patients with spinal surgeries developed surgical site infections in February. However, review of reports to management found references of no infections. Other documents showed that one neurosurgery patients and three other patients developed infections. • Staff were observed moving patients to an operating room table without following hand hygiene procedures. The same staff were then observed removing nonsterile gloves and opening a supply cabinet to remove sterile gloves. • DMC's infection control committee will meet monthly to address all incidents of infections. • More training and education of staff that includes proper sterile techniques, hand washing and use of gloves. • Communication will be enhanced to ensure reports of surgical site infections reach appropriate managers, including the CEO, chief nursing officer and director of quality and patient safety. • Noncompliance with all rules will result with correction action according to medical staff bylaws and employee rules. In 2016 and 2017, DMC also was cited for multiple infection control infractions by state and federal regulators. DMC later submitted a plan of corrections that was accepted by CMS. In response, DMC restructured its sterile processing department, including creating a second one at DMC Children's Hospital of Michigan, Crain's has reported. Each day, DMC's sterile processing department cleans and assembles thousands of instruments into surgical sets, or trays, for the hospitals of the DMC's downtown campus, which includes Receiving, Harper, Hutzel Women's and DMC Cardiovascular Center. "Inspectors return to DMC Detroit Receiving Hospital after failed review" originally appeared in Crain's Detroit Business.